The hero, Luca, navigates a world where drinking water is rare and leaders control emotions. Luca holds a secret in his head. It is a list of numbers, steps, and turns, given him by his father, The Deliverer. Luca feels too much for the government's liking, and he isn't afraid of art, and he doesn't dislike the darkness. If he isn't careful, they might come for him. They might change his mind. But the rules aren't as strict for him as for some citizens, because the secret his father gave him is the map to the Aquifer. In a world without rain, Luca and his father are the only ones who can keep their country from dying of thirst. Perhaps it will only be Luca, soon. The government in Luca's country is very dystopian, trying to forbid its citizens any emotions or contact with fine art of the past, as this might lead to them thinking for themselves and rebelling. To the degree that the government is shown as Bad, the things they forbid--love, beauty and art, truth as seen in the study of history--are brought into stark relief as Good. Characters' attitudes towards family send somewhat mixed messages. Love for your relations is obviously valued, but obedience to them is sometimes a different matter. For example, while the situation in question is complicated by local laws, it seems to be presented as praiseworthy that an adolescent is willing to blatantly disobey a parental authority in order to foster a romance with another young person who is almost a stranger. Many characters have past wrong for which they seek to make amends. Luca's country's government punishes offenders with “debriefings,” or mind-rewritings that erase emotions and key memories. Offenses considered too great for debriefing result in the perpetrator's being undone, or killed. People condemned to be undone commonly undo themselves by way of drowning, because disobeying the government by running from your sentence is almost unthinkable. Bodies of capital punishment victims are fished out of the water to prove their sentence was completed. A number of people fall to their deaths. Some were tricked in self-defense by victims they pursued, and many, many more were sent to die as collateral damage by authorities who wished to remove their families’ will to rebel. Characters see the bodies afterwards. A man is tortured and starved. Fighting breaks out when, for various reasons, the populace becomes afraid for their survival. Former oppressors, especially, are attacked en masse. There is a lot of blood. Families wait for death in an abandoned mine when they run out of food and water. Affectionate touch of any kind is taboo in Luca's country. Both Luca's country and another place seem to agree that childbirth belongs inside marriage. Teenagers think and speak about physical attraction. There is some hugging/kissing/cuddling between parties who, while they haven't had much time to get to know one another, are looking for marriage. The summary of the content in this book may make it seem very dark, and certainly, the country that Luca lives in is not a friendly place. But there is more to the world than Luca’s country and its thought police. There is also the Aquifer. And around this underwater reservoir, manning the pipes which bring water to the surface, is a community of people which still values beauty and love, and which knows certain truths about the history of the surface world. It is largely through the Aquifer, and those who have ties there, that some light leaks into the story. Back on the surface there are the Wishers, those who send out wishes like prayers and who listen to the Voice. And while many below and a few above hold on to hope for the world the country begins to wake and to see its own ugliness; and even as leaders crack down and the body count rises some strange and sudden and beautiful things are able to happen. 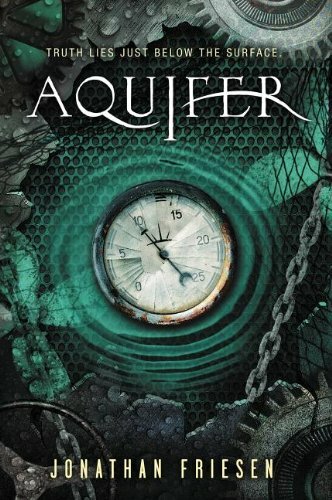 I believe Aquifer is a flawed book. It can be depressing, and there are places where its writing leaves something to be desired — a thin backstory, a rushed romance, some odd pseudoscience technobabble which hurt my suspension of disbelief. However, when it all was said and done, I found myself rather fond of the book and its good-hearted if sometimes awkward young hero, and I discovered that neither the book nor the world which it portrays were quite as grim as they seemed when it began.